Super Successful Business Leader – Tips. How does a seemingly ordinary woman become a super-successful business leader? What qualities do you need to reach and then effectively fill a top leadership position? And what qualities or actions are likely to hold you back? To find out, Kathy Hurley and Priscilla Shumway, who are themselves business leaders, interviewed 24 women holding leadership positions in a variety of industries to find out how they accounted for their own successes. The result is their new book Real Women, Real Leaders: Surviving and Succeeding in the Business World. It’s a close look at the building blocks of success for today’s executives and entrepreneurs — both male and female. Being able to deal with any kind of person will stand you in even better stead if you become an entrepreneur. Customers come in all shapes, sizes, and temperaments, and some of them will make the worst boss you ever had seem like Mother Teresa. Over time, this is going to become an even more important thing to do, as the labor market for those with top skills becomes tighter. In-demand employees who can work where they choose are likelier to choose a boss who makes them feel valued and is quick to share the spotlight when things go well. Be that boss. With that in mind, she recommends building long-lasting relationships with people throughout your industry. “They may one day be your boss or co-worker, or they may even be your next reference,” she notes. 6. Surround yourself with smart people. – It’s easy to be intimidated, but the best leaders hire and promote people who are as smart as they are themselves, or smarter. “If you can manage to throw in a few who also possess humor and humility, you will be limitless in what you can achieve,” Hurley says. 7. Spend a lot of time listening. – “It is a powerful activity,” Hurley says. “You do not have to be the idea person or the loudest person in the room.” Instead, she says, reflect on what you are hearing. “When you are able to listen and reflect on the ideas in the room, you are usually in a better position to contribute to your team.” You’ll be a better leader as well. Meeting the Need for Contact Resources !! We believe the market for on-site contract resources is growing. The nature of IT projects is evolving with the increased speed of technological change resulting in higher volume, smaller, manageable projects. Although the pool of independent contract labor is large, it is flooded with mediocre resources, making it more important to separate first-rate talent from the masses. We believe there is a better way to connect high quality, local independent IT resources with local clients. Out Talent On-Demand program provides clients with direct access to a pool of proven, high caliber, local resources. These pools, contain pre-screened resources with highly relevant skills and many who have prior work history with client. Skill, rate, availability and past performance are all maintained. TalentOD drastically reduces turnover and utilizes local resources resulting in a 40% cost saving on ORACLE contract services. In addition, building relationships with resources that have prior knowledge of your business decreases ramp up times and facilitates a stronger team working relationship. TalentOD brings the Client and Consultant closer together while maintaining the necessary third party relationship to avoid the miss-classification of contractors as employees. 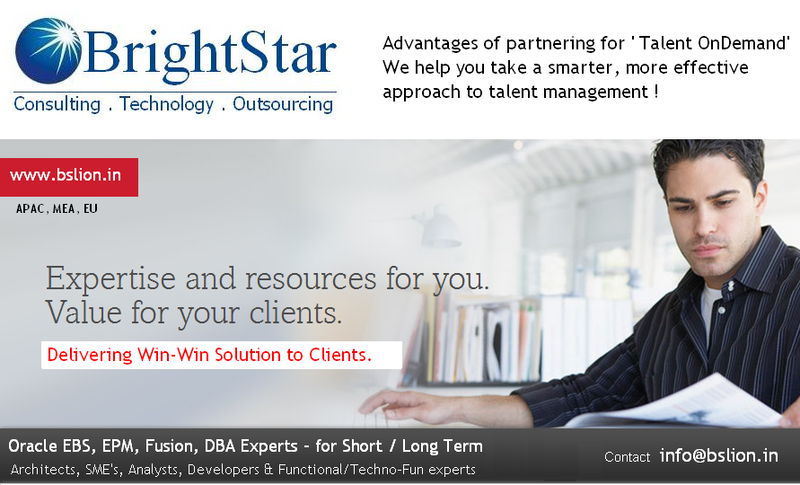 BrightStar TalentOD is a premier screening and sourcing service specializing in Oracle IT staffing. With over 20 years of experience working in the Enterprise Application industry (Oracle/SAP/Microsoft), we have a deep understanding of the needs and challenges faced by organizations that implement ORACLE as their ERP solution. Sourcing the necessary resources to meet the demand to facilitate successful ORACLE implementation and maintenance is a costly and time consuming process. More than finding available resource with the desired skill sets, it requires proper evaluation to confirm accuracy of resource skills and cultural fit. Our engagement begins by understanding the business and culture of our clients and the IT organization, landscape and ORACLE roadmap. We also believe in the importance of understanding the intricacies of individual skills needs and required personality traits. This thorough evaluation of each client’s needs streamlines the sourcing process by enabling us to present a highly accurate pool of recommended resources based on the client’s needs, budget and time requirements. 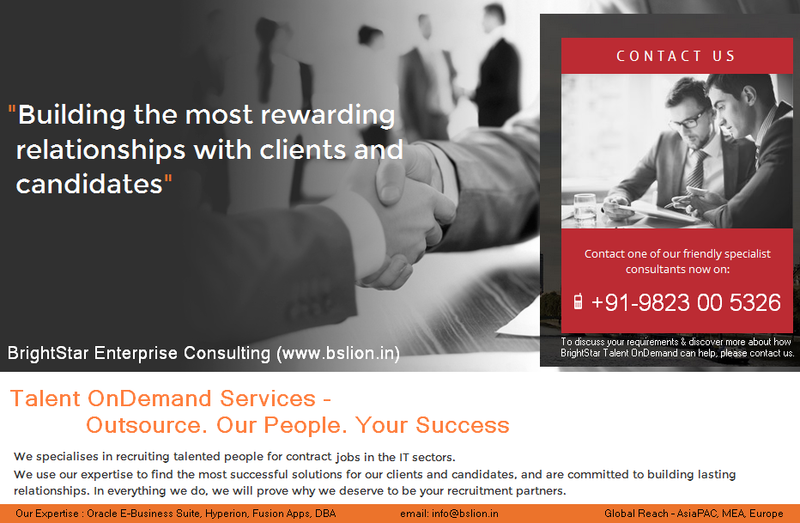 Leveraging a resource database of ORACLE consultants, we have built a reputation for excellence with our elite network known for their high quality and diversity of experience and skills. With our extensive industry experience and unique insight, we are able to make objective and accurate resource evaluations to identify the most valued consultants from the mediocre masses of the contingent labor pool. 7 Things the Best Leaders Never Fail to Do ! How does a seemingly ordinary woman become a super-successful business leader? What qualities do you need to reach and then effectively fill a Top Leadership Position? And what qualities or actions are likely to hold you back? 2. Always network, even when you don’t think you need to. 3. Always give credit to others. 4. When things go wrong, err on the side of generosity. 5. Develop relationships that go beyond a specific job or company. “Jobs may change but people stay the same,” Hurley says. Thus, she says, “Being a leader within your company is valuable, but being a leader within your industry is priceless.”With that in mind, she recommends building long lasting relationships with people throughout your industry. “They may one day be your boss or co-worker, or they may even be your next reference,” she notes. 6. Surround yourself with smart people. It’s easy to be intimidated, but the best leaders hire and promote people who are as smart as they are themselves, or smarter. “If you can manage to throw in a few who also possess humor and humility, you will be limitless in what you can achieve,” Hurley says. 7. Spend a lot of time listening. “It is a powerful activity,” Hurley says. “You do not have to be the idea person or the loudest person in the room.” Instead, she says, reflect on what you are hearing. “When you are able to listen and reflect on the ideas in the room, you are usually in a better position to contribute to your team.” You’ll be a better leader as well. Oracle Flexi Staffing – As and When you Need IT ! Just a few big name clients can make or break a startup in the enterprise space. Landing business from Fortune 500, or even 100, corporations gives young companies validation and legitimacy, not to mention revenue. However, it is extremely difficult to land these clients as a small startup. Large corporations with large budgets also come with large needs, which means their CIOs and IT buyers are understandably skeptical that startups are up to the task. If your company is geared toward the enterprise market, here are four things we’ve learned at Panaya that have helped us amass over 1,500 customers in less than 5 years, including over 60 percent of the Fortune 100. Startups pitching to enterprise companies tend to focus on how their product is valuable from a technical standpoint, or how it can reduce costs and improve efficiency. While these are important aspects, it is more important to emphasize how your product can help the organization reduce risk. Enterprise customers are notoriously risk averse. Their IT environments are complex and they have little tolerance for downtime or any events that affect their operations. Reducing risk is one of the top priorities (and pains) of CIOs who are tasked with keeping an organization’s IT infrastructure running smoothly. A startup that positions their value around their ability to reduce risk will command significant interest. For example, a lot of IT projects and maintenance are still done manually. This approach is not only slow and costly, but also provides less consistency because different people work differently. Basically, this approach is risky. If a startup can convincingly demonstrate their ability to reduce risk for the organization by using data to assess the scope of IT projects and make smart resource estimates, then the organization is going to listen. The same principle can apply to other areas of an organization as well. A product that provides intelligent lead scoring can reduce risk for sales and marketing teams, or a product that centralizes all HR activity can reduce risk around adhering to compliance standards and regulations. Startups can also reduce risk during the selling process by offering recommendations from existing customers. CIOs, CTOs, and the VPs of IT tend to believe their peers more than vendors, so if a company in a similar industry with similar pains or of a similar size says “this tool is great,” that greatly increases your credibility. The potential client has more trust that your product will live up to its claims, and this reduces risk on their end. While enterprise customers may be risk averse, that doesn’t mean that they are conservative when it comes to technology. These customers want to use the best, most innovative technology available to remain relevant and keep ahead of the competition. That said, they are not going to break their routine or move away from what they are comfortable with unless you bring to the table a product that is significantly different, better, and drives real change within their organization. The first step toward building a disruptive product is to shut up and listen. Learn about the enterprise customers’ pain points, not just the tasks they perform. Where are the inefficiencies? Where have costs increased over the years? Where are changes happening in the marketplace? How can we think outside of the box to creatively address these issues? It is also smart to focus on one specific area you are/can really be an expert in, rather than trying to go wide from the outset. It’s better to excel at one thing than be mediocre at five, especially if you are the only company excelling at that thing. Even if you have broader ambitions for down the road, tackling one specific need is a great first entry point into an organization, and then the sky’s the limit. A small size enables startups to be nimble and agile, but it can also impose some limits. This is why cooperation is the best friend of a startup selling to large organizations. Cooperation has a multiplying effect on your ability to reach a broader audience and segments of the market. Also keep in mind that the projects and activities of your clients do not happen in silos. Every department works with multiple vendors and each vendor may work across multiple areas of an organization. Within each department, there may be multiple people to talk to or ways of doing things. The reality of working with a large corporation is that it involves a tremendous amount of cooperation. It’s like participating in an orchestra where everyone has to be in sync for the performance to go smoothly. The customer needs to know you can play well with others and are committed to achieving their overarching goals. Working with partners is about creating the “triangle of win”—the partner and customer need to see the value, as does your own company. There needs to be trust, as well as a shared vision for the future. Remember that in addition to better serving the enterprise customer, a partnership should benefit your company as well. It is important to draw a map of partnerships that are relevant to your industry or segment so you don’t take on more than you can handle, and can focus on building strong relationships and building rapport in the market. A few great partnerships are more valuable than 10 weak ones. The “consumerization” of the enterprise has been talked about for a couple years now, but it remains just as relevant today. Gone are the days when enterprise technology can get by if it is laborious to implement or badly designed. The software-as-a-service model requires companies to constantly prove their value because if the end users (who are usually not the buyers or management) aren’t using it, the organization won’t renew. SaaS (News – Alert) startups don’t live on maintenance and have to keep users happy. This means it should be possible for your solution to get up and running in a couple hours. The product shouldn’t require heavy training and should be intuitive and easy-to-use. I always say that users may not be able to say yes to a product, but they can definitely say no. Once your product is up and running, you should be collecting as much data as you can to identify trends, preferences, and user behaviors from across your customer base. These insights can not only be used to improve your product, but also to keep your customers informed of how other organizations are managing similar challenges. You can turn your company into a trusted source of information for your area of expertise. From the outside, large corporations like GM, Sony, AstraZeneca, Verizon (News – Alert), and Coca Cola can seem impenetrable to small startups, but that doesn’t have to be the case. If your product solves a real need, then no customer is out-of-reach—if you can clearly and convincingly convey your value proposition, and live up to those claims. About the Author: Gaby Koren is VP Sales America at Panaya. With technology’s rapid pace of change, it’s no surprise when Oracle comes out with new releases to give you the best of technology world. While we all benefit from the increased functionality, there’s still the matter of accommodating the install base—as economical as possible—to take advantage of new capabilities. Real affordability means factoring in not just the software costs, but also the costs of managing security and availability, plus change management. But it’s all moot if you can’t access the expert resources you need for each aspect of a new Oracle release or upgrade. While you’re thinking about how to meet these challenges, you may also be wondering how you’ll address the urgent strategic development programs and new revenue-generating applications, with multi-country deployments, while driving maximum business value from the significant IT investment you are overseeing. BrightStar Enterprise Consulting offers a flexible Oracle application outsourcing solution and can tailor a suite of services—across combination of Oracle applications, E-Business Suite, Enterprise Performance Management (Hyperion), Oracle Fusion Apps and Database to meet your needs. We leveraging a global network of delivery centers, and our solution are always up-to-date on Oracle’s latest products or version releases. Our standard Oracle application outsourcing services include application maintenance, production support, small-scale enhancements, service management and release and configuration management. Each service is delivered by resources that are qualified on Oracle platform and technologies. As we work with you to help you achieve high performance, we employ a world-class set of Oracle skills and assets that we have developed. These include comprehensive methodologies, robust estimating capabilities and supporting processes and tools. Reductions of up to 50 percent in annual application maintenance costs. Improvement in development and support productivity of up to 50 percent for Oracle EBS, EPM/BI applications and up to 30 percent for Database support. These numbers are achieved while we are consistently meeting critical service levels of 99 percent or greater and enabling you to flexibly adjust your staffing volumes. BrightStar is a global enterprise application consulting, technology services and outsourcing company, with its people serving clients across AsiaPAC, MENA and Europe.